Spencer Cherrin of Huntington Woods stands in his flooded basement. Damaged prayer books there will be taken to Congregation Beth Shalom for proper burial. Flooded Detroiters find aid through agencies and synagogues. Jewish organizations in Detroit and around the country rose to the needs of last week’s flood victims as rapidly as the waters rose in the streets and basements. They provided hands-on assistance, from hauling out damaged carpets and soggy sofas from basements flooded with smelly sewage to offering financial assistance and loans.Congregation Sharey Zedek in Southfield had a free, warm Shabbat dinner waiting for its members tired after a week of cleaning up. In the first week of responding to Detroit’s historic flood caused by torrential rains on Aug. 11, there was no shortage of an outpouring of help to Jewish families in Ferndale, Oak Park, Pleasant Ridge and hardest-hit Huntington Woods. By Thursday morning, Nechama, a Jewish nonprofit disaster relief agency based in Minneapolis, had boots on the ground in Detroit. They quickly collaborated with Jewish Family Service of Metropolitan Detroit as well as other area nonprofits in the general population to help the disabled, elderly homebound and economically disadvantaged in the secular and Jewish communities. Nechama Field Operations Specialist Mark McGilvery drove through the night to arrive in Detroit the morning of Aug. 14 to mobilize a team of volunteers who could be ready to work as early as last Friday. “We are like a Home Depot on wheels,” said McGilvery, referring to the trailers stocked with a large amount of supplies and clean-up equipment they are able to bring to populations affected by natural disasters. 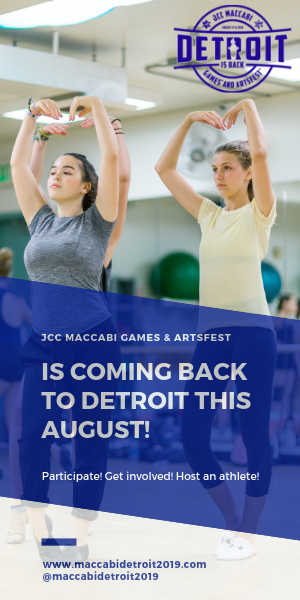 Nechama, Hebrew for comfort, has the capacity of training and mobilizing Jewish organizations in Detroit and around the country rose to the needs of last week’s flood victims as rapidly as the waters rose in the streets and basements. They provided hands-on assistance, from hauling out damaged carpets and soggy sofas from basements flooded with smelly sewage to offering financial assistance and loans. Congregation Sharey Zedek in Southfield had a free, warm Shabbat dinner waiting for its members tired after a week of cleaning up. In the first week of responding to Detroit’s historic flood caused by torrential rains on Aug. 11, there was no shortage of an outpouring of help to Jewish families in Ferndale, Oak Park, Pleasant Ridge and hardest-hit Huntington Woods. “We are like a Home Depot on wheels,” said McGilvery, referring to the trailers stocked with a large amount of supplies and clean-up equipment they are able to bring to populations affected by natural disasters. Nechama, Hebrew for comfort, has the capacity of training and mobilizing volunteer crews as large as 100 to help with debris cleanup and tearing out drywall and waterlogged flooring materials. McGilvery said his organization expects to stay in town for at least two weeks volunteer crews as large as 100 to help with debris cleanup and tearing out drywall and waterlogged flooring materials. McGilvery said his organization expects to stay in town for at least two weeks or maybe longer depending on the need. 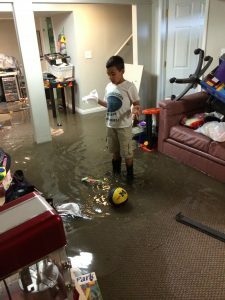 Trudeau said within the first days following the flooding, JFS received phone calls from nearly 50 community members, most JFS clients, experiencing flood-related problems and requesting help cleaning out their basements flooded with sewage backups. Callers also reported loss of major appliances, furnaces and hot water heaters. Trudeau said he expects the number of incoming calls to increase. “Our family case management supervisor said they had 10 calls in 45 minutes on Thursday afternoon,” Trudeau said. Most came from families in Oak Park and a few from Southfield and Huntington Woods. Last week, streets in these areas were deluged with huge piles of sour-smelling debris at the ends of driveways awaiting city garbage pickup. Rabbi Robert Gamer, also of Huntington Woods, found it a challenge to care for his congregants at Congregation Beth Shalom in Oak Park while he also cleaned his family’s flooded basement. In the days following the storm, he spent mornings in shorts and a T-shirt ripping out basement flooring and hauling a ruined couch to the curb before changing into more rabbinical attire to comfort congregants who recently lost a loved one as he officiated at a funeral. He also spent a great amount of time reaching out to his congregants, most living in Huntington Woods. 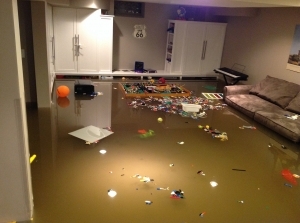 According to Gamer, around 40 to 50 families of Beth Shalom had flooding. Prayer books in basements may have been water-damaged, so Beth Shalom is collecting prayer books to ensure they receive a proper burial in a Jewish cemetery rather than ending up in a landfill with other debris. On Sunday afternoon, Gamer invited all to come together for a hot dog roast, right in his driveway. Beth Shalom supplied the hot dogs, drinks, chips and watermelon. Rabbi Aaron Starr at Congregation Shaarey Zedek said 35 congregants impacted by the flood attended a Shabbat dinner at their shul. The CSZ Sisterhood as well as Quality Kosher Catering sponsored the dinner. Susan Kirschner, executive director of Temple Emanu-El in Oak Park, said congregants “totally stepped up to the plate” in volunteering and reaching out to fellow congregants after the flood. Congregants sponsored a free Shabbat dinner attended by 80 members. Members also baked desserts, so much that there will be enough for Oneg Shabbat for many weeks to come. Rabbi Arturo Kalfus spent the greater part of last Friday delivering challahs to congregants most affected by the flooding. “This flood has taught us that we need to come together when disaster strikes,” said Kirschner. She added that several rooms in the synagogue’s basements had been flooded, including a teacher resource room, but the damage had been minimal and the temple’s organ was still in working order. And in an effort to raise awareness for relief efforts from Jewish Family Service, JN columnist and caterer Annabel Cohen set up a grill and donated 500 hot dogs to flood victims in Huntington Woods on Sunday. Flooded homes also mean a flood of business for disaster recovery companies. Cynthia Maritato Schick of Pleasant Ridge said she was fortunate enough to have connections to companies that do basement cleanup and flood restoration. Recovering from her third back surgery, she said it would have been impossible to do the cleanup herself. She was able to get a fast response from Absolute Services in Brighton. Those interested in applying for a loan can call Hebrew Free Loan at (248) 723-8184 Monday through Thursday or begin the application process online at www.hfldetroit.org. Overall, flood victims maintained a cheery outlook that “things could always be worse.” They know personal belongings they lost are “just stuff,” but they still are in a state of mourning for sentimental and priceless possessions that money cannot replace. 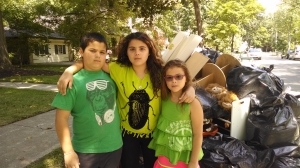 Daniella HarPaz Mechnikov of Huntington Woods was one week away from celebrating the bat mitzvah of her daughter, Pelli, when raw sewage water seeped into her family’s basement and rose to nearly 3 feet. In addition to furniture, photos and other mementoes stored in the basement were the new shoes she and her daughter were supposed to wear for the simchah. Though she has a rider on her homeowner’s insurance policy for sewer water damage that should cover the cost to replace her furnace and appliances, Mechnikov is uncertain when the family will have the money to restore their finished basement. JFS is seeking donations to help families recover from the flooding. 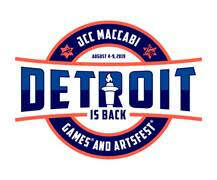 To donate, go to http://www.jfsdetroit.org/support-jfs. Donors can indicate they want to support flood relief in the comment box. Nechama is looking for donations as well as local volunteers. Call (763) 732-0610 or sign up to volunteer at www.nechama.org and click on the Detroit Area Flood Response link.